Following The Revenge of the Meatballs, comes in a theater near you the highly anticipated sequel, Once Upon A Time There Was Ragù, loosely based on the adventures of Ragù alla Bolognese on American soil. Directed and produced by One Girl In The Kitchen, with Ground Meat (in the role of Main Ingredient), Miss Pancetta, Diced Vegetables, and Tomato Paste. The movie tells the story of Ragù, which, searching for fortune, landed in the New World along with its tagliatelle at the beginning of last century. 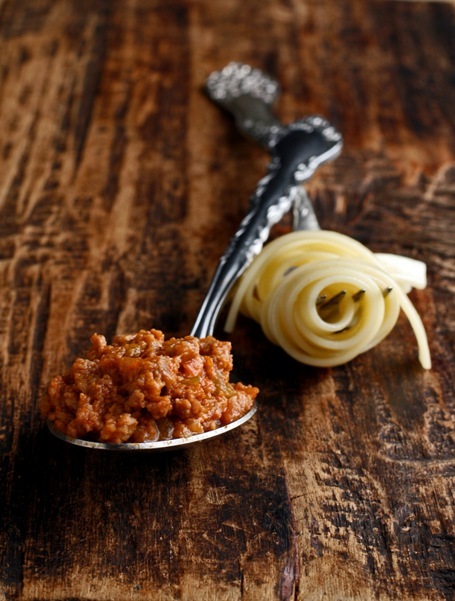 Dense, aromatic and flavorful, Ragù soon wins the heart and the palate of the local population, thanks to the ingenuity and instinct for survival of the first generation of immigrants. Before long Ragù's fame has grown enormously: from Mulberry Street to Beverly Hills, from Long Island to North Beach, everybody goes crazy for the sauce on top of spaghetti. And Ragù, under the stage name of Meat Sauce or Bolognese Sauce, is soon appointed Ambassador of Italian Cuisine in the world, along with its traveling companions Pizza, Lasagne and Eggplant Parmigiana. Not a day goes by without the four friends, under the false guise of traditional Italian dishes, appearing on the menu of some new so-called "Italian" restaurant, masking the lack of flavor with generous quantities of garlic, cream, spices of every shape and color, and cheese slices made in Chile. And just like the other three, Ragù, tired of being cooked for hours and forgetting about the quality of the ingredients, soon turns into a pale version of itself. Very little remains of the genuine and tasty boy that had landed several years before on the Atlantic shores. In a race against time, Ragù is often forced to deal with a conspiracy of carrots and onions chopped up in large pieces, treacherously allied with an army of militant garlic, a fleet of bottled tomatoes, and a brotherhood of spices at one's pleasure (including oregano, parsley, garlic powder, Italian seasoning, paprika and cayenne pepper, while of cloves not even the shadow). There are even days when Ragù, weary and tired, is prepared and placed on the lasagna in a little more than one hour (including the baking of the lasagna itself). This is really too much. Ragù, exhausted and disappointed, throws in the towel and walks away in the darkness. The movie ends with a tribute to the protagonist, broadcast live from a small kitchen in San Francisco. In an unpublished interview, the director and producer of the film, One Girl In The Kitchen, said: "I absolutely do not claim this independent production be the original, as described in the statutes of the Academy of Italian Cuisine and the Brotherhood of Tortellino. However, given the means available and the difficulty in finding the resources, I feel more than satisfied with the outcome. To all those who wish to make Ragù, I advice to plan the operation well in advance. Set aside all afternoon, carefully chop the vegetables, and most of all let it cook gently as long as it's necessary. The distinctive aroma that eventually spreads will be your reward". ground beef about 300 gr. ground pork about 200 gr. Finely chop carrots, celery, onion and pancetta. In a large pot, heat a little olive oil and a spoon of butter, add the vegetables and pancetta and cook for few minutes. Add the ground meat, and let it brown thoroughly, stirring often and "breaking it down" with a wooden spoon. Pour in the white wine, let it evaporate and then add tomato paste, dissolved in half a cup of hot broth, and 2 or 3 cloves. Season with salt and pepper. Lower the heat and simmer gently for at least two hours, stirring occasionally and adding more broth if necessary. After the first half hour add the milk and stir. At the end the ragù should be dense, with characteristic color and aroma, that must be attributed to the meat and not the tomatoes. If you can avoid being tempted by a sandwich with freshly made and still warm ragù (and how could you? ), use it to dress some tagliatelle, or divide it in smaller portions and freeze it.